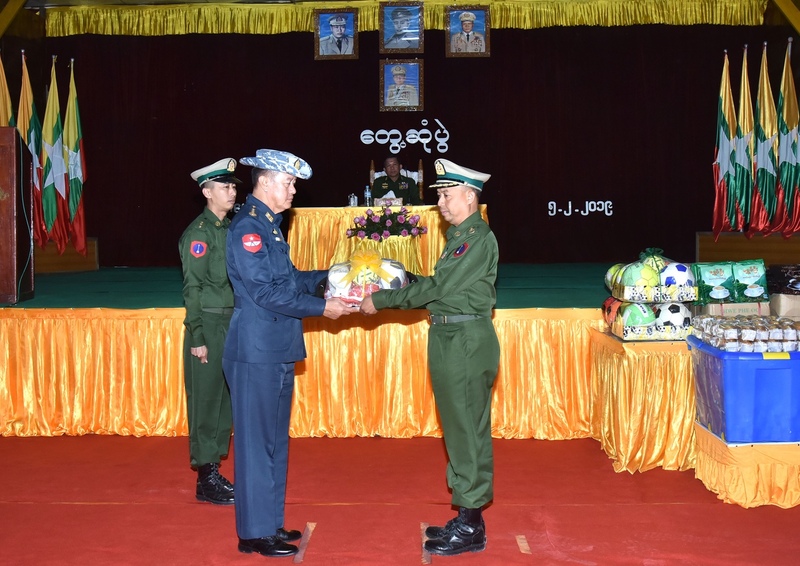 Commander-in-Chief of Defence Services Senior General Min Aung Hlaing met officers, other ranks and families of Bhamo Station of Northern Command Headquarters this morning. 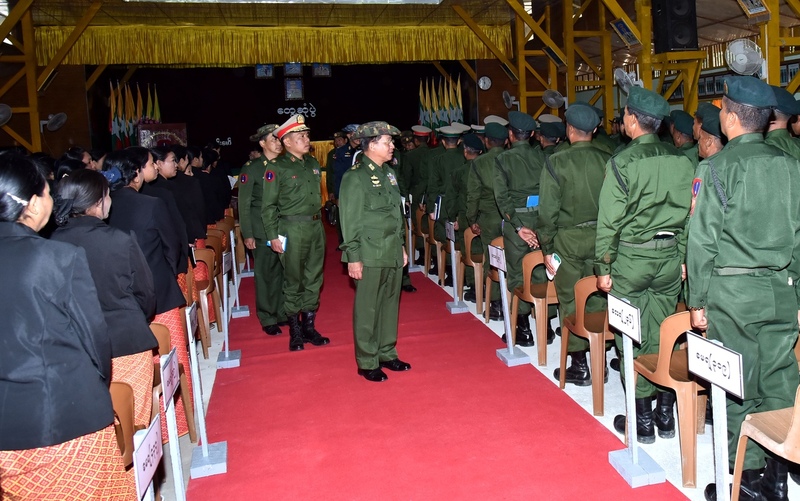 Also present at the meeting were Daw Kyu Kyu Hla, wife of the Senior General,Commander-in-Chief (Navy) Admiral Tin Aung San, Commander-in-Chief (Air) General Maung Maung Kyaw, senior military officers from the Office of the Commander-in-Chief(Army), Commander of Northern Command Maj-Gen Teza Kyaw and officers, other ranks and families of the station. In his speech, the Senior General said in terms of security, it is an important region. 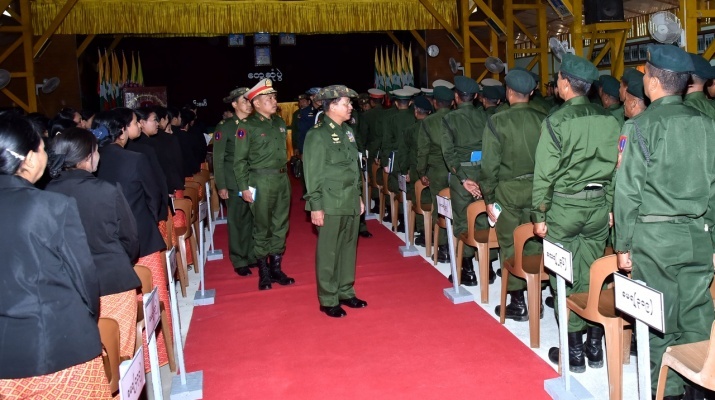 As the Tatmadaw’s main duty is national defense, its members must undergo regular training to enhance their prowess, and must have constant military awareness. They must always be battle ready. Regular training is required for individual efficiency. They must also live a healthy life and do fitness exercises regularly. As the Tatmadaw is vital part of the nation, united strength,morale, discipline, fair administration, the spirit to fight and die together, comradery,mutual attachment and obedience are also the important factors. Education promotion campaign must be launched for enhancing the qualifications of the soldiers. Farming and social welfare activities should be conducted in a correct way. 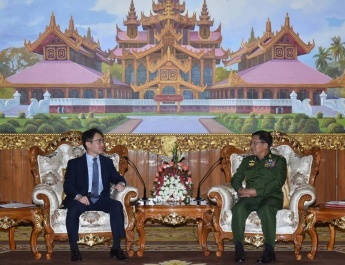 As regards the internal peace, the Senior General said the Tatmadaw, in its efforts to restore eternal peace, is upholding the ceasefire up to 30 April 2019 to hold the peace dialogue.Talks should be held soonest. It is required to sign the ceasefire agreement and keep the pledges. Development undertakings can be implemented only if there is peace. Also development tasks are being carried out, the country does not achieve progress as expected and unnecessary loss of State funds is also occurring because of the destructive acts of the armed groups. Regional development can be undertaken effectively only if there are no more armed confl icts. The country which has 135 ethnic races is on the path to forming a Union based on democracy and federal system. Various ethnic races are living in every region and state, and there is not a single region or state that is inhabited only by a single race. The number of Bamar and Shan ethnic races living in Kachin State is greater than the population of Kachin ethnic races. Peace cannot be restored it there are hostilities between persons or groups.Every country has only one armed forces.Multiple national races are serving in the Tatmadaw. Peace should not be considered through an impossible unilateral demand but it must be considered with Union spirit for the whole country. Aims must be set for Myanmar to become a consolidated, united union. The constitution has also provided equal rights for individual citizens and all nationalities. The Tatmadaw is steering the country for its political affairs. Such efforts can be exerted in accord with the laws and disciplines with a view to seeing the country as the whole. The Tatmadaw really wants to achieve eternal peace for the peace and stability of the country. 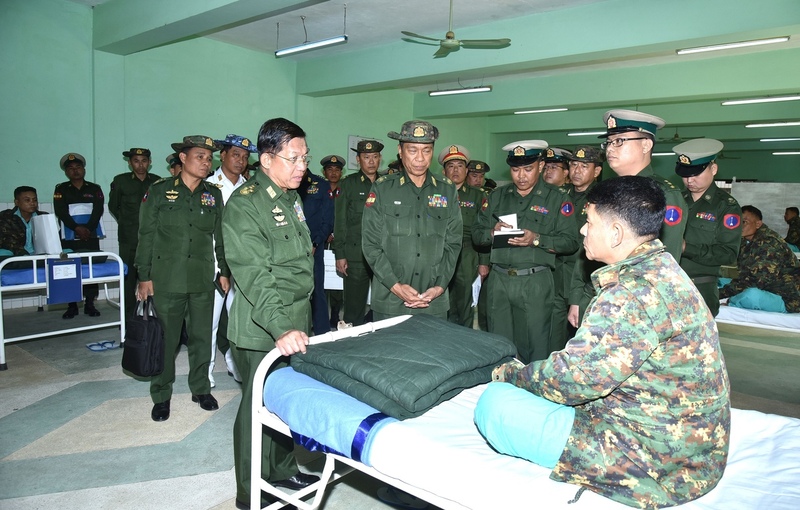 The Tatmadaw is acting in accord with the laws and disciplines in shouldering national defence duties and all must cooperate in building up a Tatmadaw on which people can rely. Next, the Senior General presented foodstuffs to officers and other ranks and their families from the station and his wife cash awards to the station maternal and child welfare association through officials. 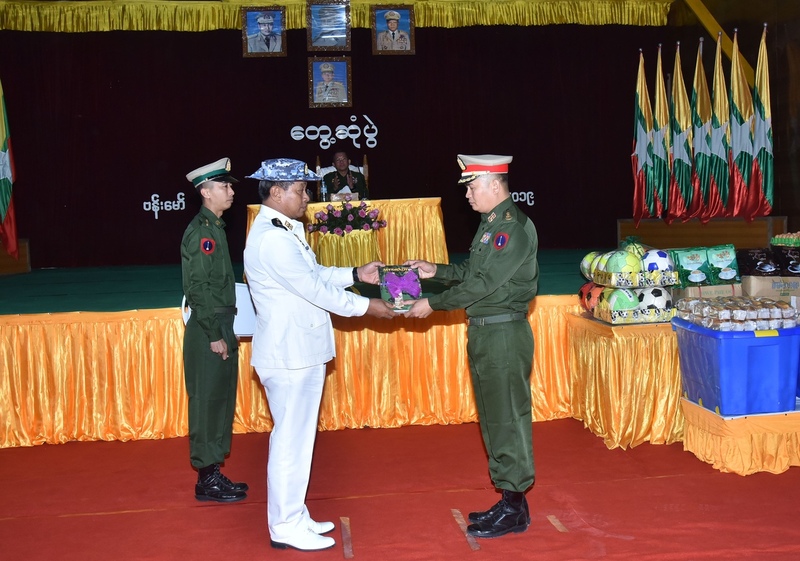 Then, the Commander-in-Chief (Navy),the Commander-in-Chief (Air) and senior military officers from the Office of the Commander-in-Chief (Army) presented fiction and non-fiction publications, sport equipment and foodstuffs and officials received them. After the meeting, the Senior General, wife and party cordially greeted the officers, other ranks and their families. 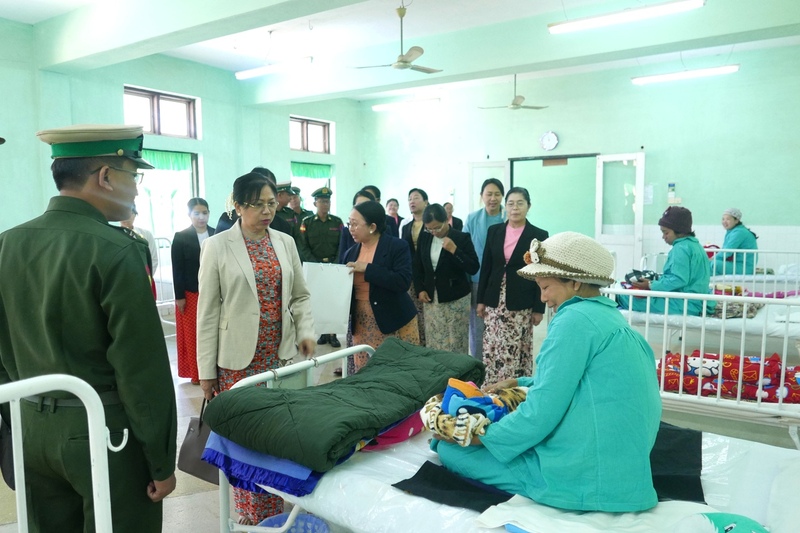 Afterwards, the Senior General and party cordially greeted and comforted the soldiers receiving medical treatment at local Tatmadaw hospitals in Myitkyina and Bhamo and presented foodstuffs to them.The Senior General’s wife also comforted and presented foodstuffs to Tatmadaw family members receiving treatment in women’swards. 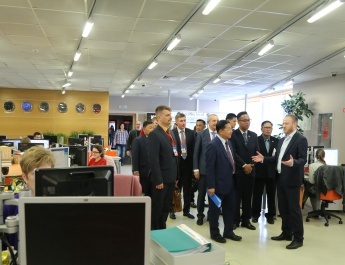 Later, the Senior General met with departmental officials from Bhamo and discussed regional development work. He then urged officials concerned to motivate local growers to boost agricultural undertakings and produce finished goods with the use of electricity available. 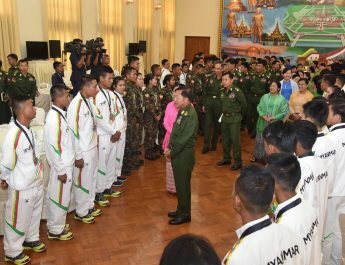 The Senior General gave advice on avoiding alcohol,smoking and chewing betel quid and called for efforts for a drug-free region, cooperation among teachers, students, parents and local authorities in turning out more educated ethnic locals and the Tatmadaw’s assistance for regional development.